If we want to obtain a 5V voltage from only 2 NiMH batteries, we´ll face the fact, that the most of common DC/DC circuits doesn´t operate at such a low voltage. LT1304 controller belongs among circuits, which handle this situation without problems and it also provides several extra things. To obtain 3.3 or 5V from a lower voltage is a typical requirement at battery-powered or portable devices. Naturally, to obtain 5V it is also possible to use 4-5 NiMH cells or 2 Li-Po cells, but then the device is uselessly bigger, heavier and more expensive. The solution is just the usage of a suitable step-up circuit. LT1304 from Linear Technology belongs to „MicroPower“ DC/DC step-up circuits operating already from a very small voltage, 1.5V typically. Thanks to a very low power consumption (10uA/Shutdown) and a built-in independent low battery detector, it is optimized for usage with batteries. LT1304 needs for its operation only a few external components - 2 capacitors, 1 inductor and 1 diode is all that is necessary to create an operating DC/DC circuit. LT1304 is available in 3 versions - LT1304VCS8-5, LT1304CS8-3,3 with fixed voltages and LT1304CS8 with adjustable output. Versions with fixed output voltages don´t need a divider in a feedback, what further simplifies a circuit. 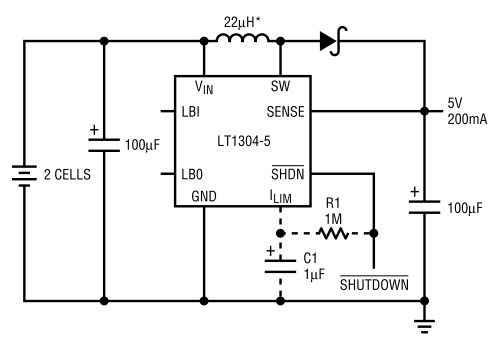 The input for low battery monitoring - LBI (1,17V) operates even in Shutdown mode (SHDN). LBI can be connected through an appropriate voltage divider, setting a level at which the LBO output will switch (open collector). Maximal current through a coil and an internal switch is limited to 1A. If the current was to exceed this level, LT1304 will shorten the ton in a given cycle, thus preventing a further increase of current. A big plus is the ILIM input, where we can adjust (decrease) the max. coil current by adding a single resistor. In this case, LT1304 shortens the tON of every cycle. In many cases, this can help prevent coil saturation and alternatively also to decrease DC (Ohmic) losses in a coil. LT1304 works in a „BurstMode“, i.e. in the mode of continuous operation in so called “bursts” with a fixed length of every cycle - tON (6 us) and tOFF (1.5us). Only when a current limitation is adjusted, the tON period gets shortened if necessary. It means, that D (duty cycle = tON/(tON+tOFF)) is commonly 0.8 or lower, if the current limitation will act. For a continuous mode of operation of every step-up converter is valid, that D=1-VIN/VOUT, i.e. the output voltage depends only from D. That´s why it´s good to keep on mind, that if we want to take a considerable current from the input, we can´t use an excessively low value of coil inductance at the same time, because the inner current limitation will act by shortening tON, what will decrease the D value. If we´ll drop below the D value lower than minimum necessary to reach a desired output voltage, the output voltage will decrease. If we only need a small output current but a high output voltage (for example 12V from 2V), it is necessary to use a discontinuous mode, when a coil current drops in every cycle down to zero, as it is described in the datasheet. The disadvantage is bigger ripple, an advantage is a relatively very small inductor necessary in this case. Choice of an inductor is not critical and the circuit will operate properly in a wie range of inductance values. 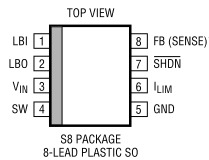 Guide values are mentioned in the datasheet, however it is worth to pay attention to its choice, because it influences the efficiency of the circuit and the output voltage ripple. Excessively low value of L will cause high current ripple resulting in increased demands for input and output filtering capacitors and it will also worsen the EMI. On the other side, an excessively high value of L will worsen a response of the circuit at a sudden change of load. This Micropower LT1304 part has around 50%-85% power efficiency, while other parts typically offer 70%-90%, so it's not really the best choice for many ultra-low-power circuits. It also requires more secondary parts (including an inductor) than most other DC-DC voltage converters which increases final footprint and cost, the extra parts do add more versatility but I honestly can't think of a lot of things you'd want to tweak on a basic low-voltage power regulator, lol. I think most hobbyists would likely purchase complete power modules (like one of these) at essentially the same cost. The tradeoffs and (dis)advantages distinguishing the LT1304 vs similar parts wouldn't be significant unless you're engineering some sort of mass produced application.